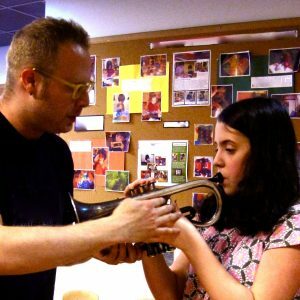 12pm and 1pm – Blast of Brass: An interactive concert featuring the science and fun of making music with the brass family of instruments at the Brooklyn Children’s Museum: 145 Brooklyn Ave, Brooklyn, NY 11213 (718) 735-4400. Featuring: Jesse Neuman, Elizabeth Frascoia (trombone), John Altieri (tuba), and Brian Adler (drums). Jazz trumpeter and educator Jesse Neuman presents a concert for the whole family. Learn about (and try out!) trumpets, trombones, tubas, and other instruments of the brass family. See how serious science meets serious swing, as the musicians perform and explain several styles of brass influence music, and give kids ages 5 to 12 an up close listen to these joyous instruments. Featuring Jesse Neuman (trumpet), Elizabeth Frascoia (trombone), Jon Altieri (tuba) and Brian Adler (drums).